The Vampire Diaries Nina Dobrev Returns for Season 8 After Ian Somerhalder Exit – Elena Replaces Damon? “The Vampire Diaries” has been subject to a lot of renewal speculation now that Ian Somerhalder revealed he’s leaving after Season 8. This follows last week’s announcement that Bonnie Bennett portrayer Kat Graham has said Season 8 would be her last hurrah. Will Nina Dobrev return to resurrect the show from certain cancellation? Ian Somerhalder spoke at Nashville’s WalkerStalkerCon and said, “We have decided to do one last season to really do the story justice.” TVD has suffered dropping ratings since Nina Dobrev’s exit as central character Elena. But could Elena’s comeback turn the show around? After Nina Dobrev announced her departure from “The Vampire Diaries” due in no small part to Ian Somerhalder’s romance, engagement and subsequent marriage to Nikki Reed, the show has suffered. Yet Ian Somerhalder seemed determine to prove he could carry the show without Dobrev. Good luck with that Ian! As falling ratings can attest, that’s just not true. But is Nina Dobrev planning on turning the tables on Somerhalder and revitalizing the show into a hit once he leaves? It would be very satisfying if Dobrev could do what Somerhalder could not – make “The Vampire Diaries” a success on her own. We know that TVD plotlines require Bonnie to die in order for Elena to be resurrected from her Sleeping Beauty trance and Kat Graham’s announced exit makes room for just such an occurrence. Yet Ian Somerhalder seems to think his departure means the demise of The CW show. But could Nina Dobrev and TVD showrunners have other plans? Could Bonnie die and Somerhalder’s character Damon Salvatore be killed off at the same time to make room for Dobrev’s Elena Gilbert to return without the spectre of a renewed romance between the two? The crux of “The Vampire Diaries” has been the love triangle between Damon, Elena and Stefan (Paul Wesley). But it would be easy enough to boot both the Salvatores off The CW program and make it the Elena show. Dobrev would no doubt love to return as the sole star and revive the series. Why not? The Originals spin-off has done admirably well despite its middling ratings. Surely TVD writers could conceive of a storyline where Elena is the VIP vamp of Mystic Falls, a reigning queen of the small town, who has intrigues and romance without any awkward Salvatore involvement. There are lots of interesting ancillary characters that could step up into greater prominence to be her supporting cast. Enzo St John (Michael Malarkey) is a vampire hottie that could be the perfect romantic foil for Elena. Matt Donovan (Zach Roerig) is Elena’s high school sweetie and now a full-fledged vampire hunter so he’d be a perfect antagonist for Elena to deal with – and Caroline Forbes portrayer Candice King has made no departure announcements so she could linger as Elena’s sole BFF. The bottom line is, Nina Dobrev may be plotting to allow Ian Somerhalder to make his exit plans under the assumption that “The Vampire Diaries” is ending while she schemes to swoop in and make the show her own as the sole star and return TVD to its former ratings glory. What do you think fans of “The Vampire Diaries”? Could Nina Dobrev carry The CW show on her slim shoulders? Would you watch TVD if there were no Salvatores left in the mix? Share your comments below and check back with CDL for live recaps of “The Vampire Diaries” every week plus more news. Ian Somerhalder Quitting ‘The Vampire Diaries’ to End Nina Dobrev Association – Instagram Hints Imply Nikki Reed Push? 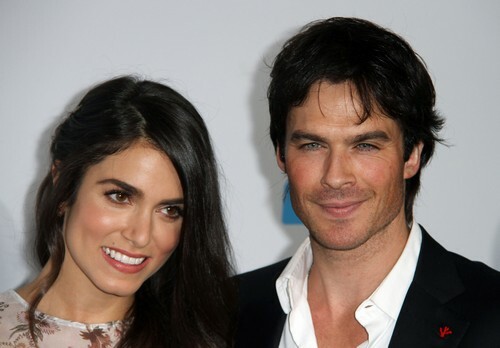 Ian Somerhalder, Nikki Reed Engagement – Officially Announce They’re Engaged After Vampire Diaries Season 6 Ends? Is Nina Dobrev Seeing Ian Somerhalder Post Nikki Reed Engagement: Evan Rachel Wood Warns BFF of Potential Cheating? Nina Dobrev Stunned and Disgusted at The Vampire Diaries Renewal News?